Have you ever wondered what you look like to your baby? Now you can catch a glimpse. You've probably heard that a newborn baby can only see fuzzy shapes about 8 to 12 inches from his face, but what does that actually look like? David Hunter, MD, PhD, a pediatric ophthalmologist, is all too familiar with that question. “Time and again, whether I’m in the office or even if I’m at a cocktail party, if I bump into to a new mom, they’ll want to know, ‘What can my baby see? '” he told CBS. The common conversation got Dr. Hunter thinking: What if there were an app for that? So, he and a team from REBI Scan have developed BabySee, a technology that allows parents to (literally) see through the eyes of a child. All you have to do is download the free app, enter your baby's birthday, and then aim your phone's camera wherever you want. The app will take the image you're aiming at and simulate what the scene looks like to your child, based on his stage of development. Here's a bonus: If you position your phone like you're taking a selfie, you can see how your baby sees you. "You turn it around and see your own face and what features of your face a baby might or might not be able to make out,” Dr. Hunter said. Genius, right? Dr. Hunter and his colleagues took decades of research into account when building the app. "As it happens, scientists have devoted years learning about how the eye and brain develop and conducted hundreds of studies learning how babies discern clarity, color, and contrast," a description for the app reads. Parents are taking note—BabySee has already been downloaded 15,000 times in 40 different countries. New mom Kailee Algee sees the value in this sort of technology. “I think it’ll be really exciting to watch how things start and watch that progression over time as she grows...to see how the vision develops from her perspective,” she told CBS. 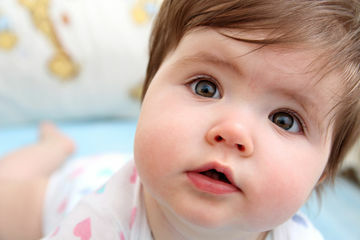 Have you ever wondered what your baby sees when he or she looks at you? Will you give this app a try? Tell us in the comments!